This section displays the active MLS listings in The Hills of Texas, the Overlook, and the Hills of Texas Estates. If you see a home that interests you, call Jim at 512.913.1557. Neighborhood Location: The Hills of Texas subdivision is located southwest of Austin on the north side of FM-1826. Take Mopac & SH-45 to FM-1826, then turn left. 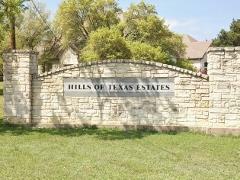 The entrance is about 2 miles on the right at Kemp Hills Dr.
Scroll down to see more info on the Hills of Texas subdivision. The table of Austin MLS data below is aimed at giving you an overview of real estate activity and home sales in The Hills of Texas over the past 8 years. The Hills of Texas real estate market data from the Austin Board of Realtors 1/1/2011 - 12/31/2018. The Hills of Texas. This section has 62 homesites. These custom homes are built typically on 0.5-acre lots, though some are a bit larger. The homes in this part of the neighborhood, built in the years 1986 through 1999, are 1- and 2-story structures with approximately 1700-2700 sq. ft. of living space. The Hills of Texas Estates. This area also has 62 lots, most of which have been developed with one-story or two-story homes. The Estates homes were built primarily in the years 1996-2007, and one new custom home was added in 2011. The lots are mostly around 2 acres +/- in size. Deed restrictions allow a couple of horses on a handful of lots that are roughly 4 acres and larger in size. 4 horses are allowed on the largest lot (almost 12 acres). 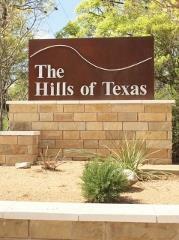 17 of the lots in The Hills of Texas Estates are gated. Home sizes in the Estates range from around 2,500 sq. ft. to over 4,500 sq. ft. Views from a number of the homesites are very nice. The Overlook at The Hills of Texas. Most of the homes in The Overlook, a second gated area of The Hills of Texas, were built in the years 2000 to 2007. These 26 lots range from 1.0 to around 1.5 acres, and have some lovely Hill Country views. Homes in this part of the neighborhood range in size from around 2,800 sq. ft. to 3,500 sq. ft. The Hills of Texas is a low-traffic community that is conveniently located just off FM-1826. Travel to Mopac and Austin is pretty simple, as is travel to US-290 and parts west, and to places south (Kyle & Wimberley) via FM-150. It is near a favorite Austin-area eating spot, the Salt Lick Restaurant, and many other shopping centers and recreational outlets in the S/SW Austin area. Tax rates for this neighborhood in 2015 were set at $2.09/$100 of assessed property value, a relatively low rate for the Austin area. The main tax entities are the Dripping Springs ISD and Hays County. Water supply is from LCRA. All homes in this development have septic systems. Home buyers should verify HOA requirements in The Hills of Texas neighborhoods. There are no community amenities, such as park, playground and pool. The Hills of Texas subdivision is located within the boundaries of the Dripping Springs Independent School District. Before purchasing a home in The Hills of Texas, parents and prospective homeowners should verify current school assignments with the Dripping Springs ISD.